Lumia 950 XL is a flagship Windows smartphone and it was announced by Microsoft in October 2015. It seems that the device is not doing so well in the market, therefore, Microsoft has announced a new buy one get one offer on the Lumia 950 XL. Users will get a free Lumia 950 worth $549 when they buy an unlocked Lumia 950 XL from the Microsoft offline or online Store. The offer is currently valid only for Microsoft store in US/Canada and users will only get a Black Lumia 950 as the free device when they buy Lumia 950 XL for $649 in any color option. You can visit the Microsoft Store and avail the offer till 1st May 2016 or till stocks last. Additionally, users will also get 1 Year subscription for Office 365 Personal for free which users can claim using the Lumia offers app present on the new Lumia 950 XL. Microsoft has also made it clear that this offer is not valid on prior orders or purchases. The company is also running trade-in offer where you can get $150 off on Lumia 950 or 950 XL when you trade-in your old Lumia 920, 925 or 1020 device. You cannot avail both the offers at the same time. This means you can either opt for the trade-in discount or get a free Lumia 950 which purchasing the Lumia 950 XL. If you are thinking whether you should buy the Lumia 950 XL or not, let me tell you that the smartphone does have good features and specifications. It comes with a 5.7-inch WQHD display and has an impressive 20-megapixel back camera with ZEISS optics. The phone is powered by a Snapdragon 810 processor along with 3 GB RAM and the only issue is that it runs on Windows 10. But if you love Windows Smartphone or want to try one then this is the best time to do so. Microsoft Lumia 950 XL also offers some interesting features like Iris Scan, Liquid Cooling, and Continuum. The phone is powered by a Snapdragon 810 processor along with 3 GB RAM and the only issue is that it runs on Windows 10 which is not the best Operating system for smartphones. But if you love Windows Smartphone or want to try one then this is the best time to do so. 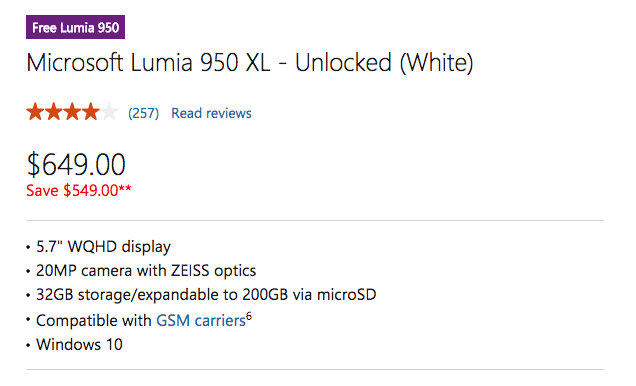 We have also covered a separate post about Lumia 950 XL listing 5 reasons to buy Lumia 950 XL as your next smartphone. Do you already own a Windows smartphone? Or are you planning to buy one? Do let us know what do you feel about this incredible offer from Microsoft by leaving a comment below.